Imagine a peaceful place, surrounded by green atmosphere. Sounds of wind envelop bamboo leaves, birds singing, the pounding of the river flow. Listen to the sound of nature which will greet you in the purity of heart. There are many local wisdoms which will gotten in Kanekes village, a very meaningful lesson, remembering us of the most ancient ancestral identity in Nusantara which still live with traditional ways. Forget your handphone or another electronic tools when you visit Kanekes village or in popular name called Baduy village, in Banten province. Besides there's no electric to charge you handphone battery, even handphone signal is difficult gotten. It's better if you see the nature scenery and listen to the sounds of nature. In this place you can get the past life before entering an age of industrial revolution which control the world nowadays. 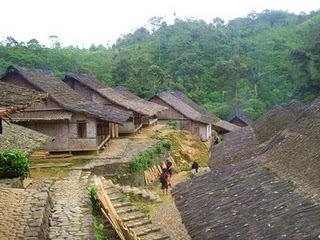 Baduy village, located in the hills of Mount kendeng, about 75 km in the southward of Rangkasbitung, Banten. This is the exact place for you who want feeling a peacefulness that seldom found in the big city. For the people who have strong adventure instinct, trekking in Baduy village is very awesome. The daily activities of Baduy society which is keeping their unique traditional culture are special allure for all of you who interested in discovering of unique culture of incredible local wisdoms. 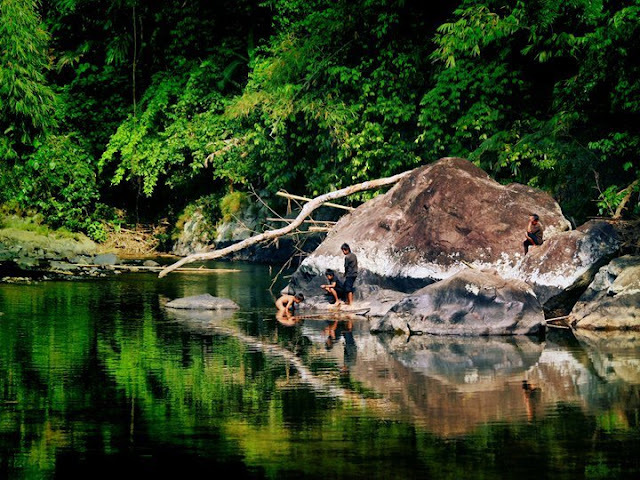 Baduy's region exactly located in Kanekes village, Leuwidamar sub-district, Lebak regency. 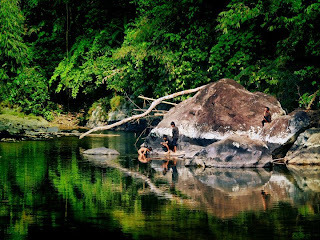 Approximately in the end of 18th century, the region of baduy is extend outward from Leuwidamar sub-district nowadays until South beach. Now, the area of Baduy is about 5.102 hectare. The boundaries nowadays is made in the beggining of 20th century, parallel with the opening of rubber plantations in Leuwidamar village and around it. Baduy tribe usually called urang Kanekes. Baduy is actually not the name of an existing community in this village. That name is given by Dutch scientist which equating them with Badawi or Arab Bedoin where they're nomaden society. From Badawi or bedoin, then the name is shifted become Baduy. Baduy people, because they live in Kanekes village, actually they must be called as Kanekes people. But because of 'Baduy term' has been known firstly, then name of 'Baduy' is more popular than "Kanekes people"
They live in Kanekes village, Leuwidamar sub-district, Lebak regency, Banten province. This village is about 38 km from mother city of Lebak regency, Rangkasbitung or it's about 120 km from Jakarta. 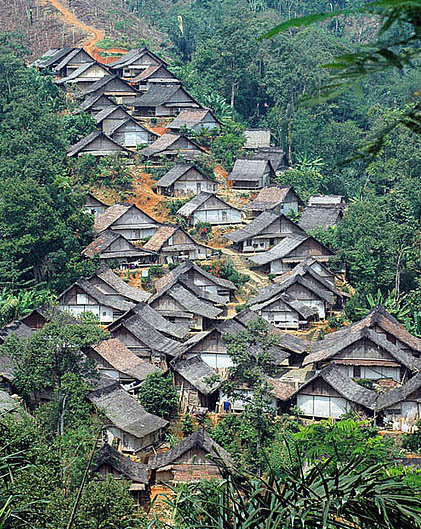 Kanekes village has 56 baduy villages. The inner Baduy people live in Cikeusik village, Cikertawana village, and Cibeo village. Whereas the outer Baduy people live in 53 other villages. The Village of outer Baduy people often called as Panamping village or also called as companion village (Pendamping in Indonesian) because it has function to keep the village of inner Baduy people. 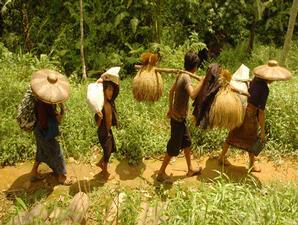 The daily activities of Baduy men use white headband. Except for 'puun' or indigenous elders, they use black shirt and dark blue knee-length sarong with square motif. The women use blue batik sarong, blue kemben, white shirt with long sleeves. The girls use bracelet and necklace from beads. The inner Baduy tribe, they always go on foot while they do travel, honesty is their priority, refuse to contaminate the environment (land and water), and the're not smoking. The inner Baduy people apply their custom more strictly than outer Baduy people. One of the difference is, outer Baduy people is allowed to have a vehicle and drive it. inner Baduy live in strict custom. In inner Baduy, custom rules can't be offered. This is different with outer Baduy. In terms of food, Baduy people is classified as fanatic people. They'll not eat kind of food which is not eaten by their ancestors. They also don't do something which in the past, their ancestor never do that. When they take a bath, they don't use soap and this custom still continues until now. It dosen't mean they don't have money, but they really follow their ancestor's custom. If they (inner Baduy people) try to break those rules and their action is caught by someone, they will get stern warning even they will be issued from the society of inner Baduy. Based on the belief of Kanekes people, they're ancestry of Batara Cikal, one of seven Gods or called batara who sent to the earth. It is also often connected with Prophet Adam as their first ancestor. Based on their belief, Adam and his ancestry included Kanekes people have duty to live as an ascetic to keep the world harmony. The belief of Baduy people is a tribute to their ancestor's spirits and it also the belief of one God which is called as Nu Kawasa. Their belief often called as Sunda Wiwitan. The orientation, the concepts, and religious activities is addressed into 'pikukuh' (traditional rules) in order the people live based on the grooves and also make a welfare for the world and Baduy people. The belief of Kanekes people called as Sunda Wiwitan is rooted of the worship to their ancestor's spirits. In its development also influenced by Buddhist, Hindu, and Islam. The essence of its belief is indicated for pikukuh (absolute custom rule) which is followed in their daily activities. The most important contents of those rules is concept "without any changes" or "change as little as possible". In inner Baduy region, there are three villages which each village is led by tribe leader or called as "Puun" and the vice called Jaro. The three village are Cibeo village, Cikesik village, and Cikertawana village. Each "Puun" has different role. Puun Cibeo has a task to handle the agriculture, Puun Cikesik has a task to handle the religious activity, and Puun Cikertawana has responsibility in health and drugs. This responsibility applies collectively to the three villages. Local government of Lebak since 1990 declares that a region of Baduy society is cultural heritage. They still keep defend their patrimony and this patrimony is national asset too that must be protected. It has been confirmed with Local Regulation No 13/1990. By this regulation, the forest and river are keep to be maintained its beauty and naturalness. According to the information from Village leader which is represented by Jaro, Baduy tribe occupies 5.101 hectare of area which is divided into 53 villages. 3 villages for inner Baduy and the rest is occupied by outer Baduy. Those Baduy tribes live exactly in the foot of Mountains Kendeng in Kanekes village, Leuwidamar sub-district, Lebak regency, Banten. Any kind of vehicles must be abandoned in Cibogelar village and start your travel by exploring Baduy nature by go on foot. The atmosphere in Baduy region is very cool and natural. There's no air polution and dirty environment. The travel from village to another village through footpath which sometimes cross some rivers and hills, or through bamboo bridge with natural construction without using nails. It will make you startled when you know that there are many things that can be done without using electric or another modern tools. The fact is Baduy tribe can survive well with the incredible local wisdoms. The air in this village is very refreshing, make you forget your tiredness. 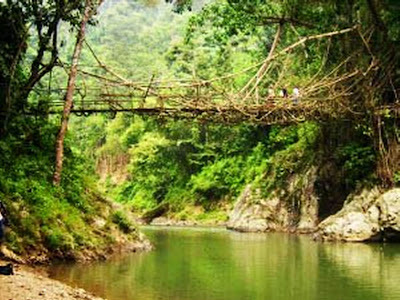 In the travel in the village, look at how thin bamboo bridge and long curved on the river where its end is inner Baduy region. In Cibeo village you can see unique and incredible sceneries. Stilt houses is neat by the same size and it also lined nicely. Each house has at least equal interior. Inside the house, there's a rectangle room, it leaves the L-shaped room for the rest of the room. There are a stove in both room, make those roof become black in the inside. By using woven wall and the short stairs that stuck to the ground. In the middle there is field with the low stair. In one of the ends there's hall, the place for backwoods's agenda. In the another ends is the place of Puun, the village elder. This backwoods is surrounded by mount, so the dark come fastly. And one things that you only can do is conversed with and friendly Baduy's society in their home. 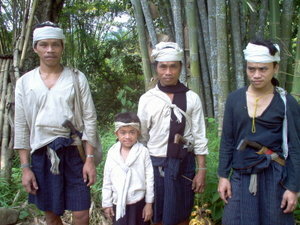 Everyday, Baduy people use Sunda language by the dialect of Sunda-Banten. However, a lot of them is able to use Indonesian language and they also usually often interact with visitors. They always help visitors to show the directions or carry the visitor's goods. They never mind if you ask about their custom and belief. Every Baduy citizens is given a responsibility to keep their environment because of according to their belief, the universe and its contents is God's possession and must be protected from the damage. Nature must be conserved for the future importance and their children and grandchildren. Baduy tribe is prohibited to cut the trees in the forest that has been determined. Because of that, the air become fresh which is surrounded by green nature. The sky looks clear. Also with the bird's singing, sounds of chickens and clear water is easy heard. When you're in the middle of Baduy society, you will feel the past atmosphere. The society in the past still alive with their lumpy traditional values without Technology touch at all. When the night comes the atmosphere become diaphanous, deserted, calm, and the dark comes to lunge. There's no light from electric lamp, only light blink from the oil lamp filled of coconut oil by the burner from coconut fiber. In this village, you can only hear natural sound which is surrounded by birds singing and sounds of water fell from the cliff. The river water is very clear because Baduy people are prohibited using products which contain chemicals like soap, toothpaste, shampo and they're also prohibited throw rubbish into the river. Baduy people always take a bath in the river and while they want to clean up their body, they use traditional cleaner from the leaves and the sap of tree roots. If you want to visit Kanekes village besides preparing your physic, you have to ready to respect and obey the traditional rules which is prevailed in the society of Baduy tribe made by Jaro (Village elder of Kanekes). Baduy people everyday use rough Sundanese language. The language used doesn't know about language level or language usage based on social status. Besides use Indonesian language, some inner Baduy people can use some words using betawi dialect, even they sometimes use some english words. The respect to the visitors never be shown by using polite language, but it's shown by their polite and kind attitude. Baduy people also like jokes, but only with the people who already familiar with them. Be friend with baduy people will help you and this is not difficult because of Baduy people has open attitude for everyone even foreigner. Inner Baduy people also accepts visitors though they must obey many rules when you live around them. But in the outside, they accept visitors kindly. The visitors are prohibited to bring radio, guitar, air rifle, prohibited to catch or kill the animals, don't throw the rubbish offhand, don't cut the trees, don't leave the fire in the forest, don't consume intoxicating beverages and don't violate the norm. If you want to take a bath, you can do this in the shower outside the backwoods exactly in the river which become the hamlet boundary. Using chemicals such as soap, toothpaste, shampo are prohibited. However it will be an unique experience in your travel. A way of life which back to the nature perfectly. Baduy tribe are very restricting of modern touch, especially in electric and other electronic tools. For the lights, Baduy tribe always use candle not like the torch. You can use flashlight to make you easy if you wanna go to toilet in the night. So I suggest you to don't use handphone, camera, or radio. If you're in outer Baduy region you can take a photo however in inner Baduy region is not allowed. If you stay overnight in outer Baduy village you can use soap or shampoo while you take a bath. Personal medicine must be brought because of in the Baduy village, there's no puskesmas or drugstore. Shoes is recommended in order make you not easy to slip, moreover on the uphill road. Don't forget to bring jacket or raincoat also bag cover which water resistant to protect your goods. Anti-mosquitos oil is very usefull to dispels insects especially when you travel in the forest. On the Month Kawulu where this is harvest period for three months continuously in February until April, you should not to go to Kanekes village because inner Baduy region is closed totally. However, for the visitors on Month Kawalu can meet inner Baduy citizens when they out of their village. Baduy area is about 40 km from Rangkasbitung city. If you want to go there, you can use personal car or public transport about one hours from Rangkasbitung. To reach Baduy village, it can be done by through Rangkasbitung - Ciboleger, by bus, public car or personal car. In Cibogeler, there's an entrance to Baduy area. Please rent a car and the car must be stopped in Cibogelar village. You also can use car from rangkasbitung to Cibogelar terminal or rent until you in Cijahe, then continue by walk to arrive in inner Baduy village. From Tanah Abang, central Jakarta, please use the train to Merak via Rangkasbitung and it's about 1,5 hours. From Rangkasbitung, use public transport (called ELF by local people) to Cibogelar. The travel take your time approximately 2,5 hours. Family statue in Cibogelar will greet your arrival. Follow the footpath by walk and enjoy the nature scenery around you, and then you will through Gajeboh village. In here you can see Baduy women weaves the clothes. Continue your travel by crossing Ciujung river, the widest river in Baduy region. Look at the bridge made from bamboo which is tied to one another, but don't worry because this bridge is strong. Then you will enter Cicakal vilage. In here you can take a rest and stay overnight. The travel by walk from Cibogelar to Cicakal takes the time approximately 12 hours. Another alternative, you can use Koranji then through Kroya market. Every week, Baduy citizens visit this market to exchange their harvest with goods they need. From this place, they'll move into Cikapol village. If you interested to stay overnight you can stay in Baduy traditional houses, in Cicakal vilage. Those houses is built from braided bamboo and the roof is fibers. These houses can still stand until 25 years but the roof must be changed every five years. Baduy people don't use electronic technology, so don't expect you will find electric tools here. All house of Baduy tribe is equal, it has platform and also it stand one metre on the ground. The chassis is made from woods, the wall from bamboo, and the roof from fibres. The building is following land contour, always face to face each other so it looks unique and neat. Baduy houses don't use window. It only has entrance in the front and exit door at the rear. Sometimes there's one door in the front, also on the front there's place to gab with guests or family.